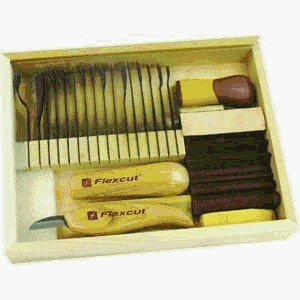 Flexcut Tool Company's SK108 20-Piece Carving Starter Set gives artisans a selection of 17 blades, two interchangeable handles, and the basics of a sharpening system all in one compact case. This collection of good tools is not the traditional approach, using light spring steel blades instead of heavy forged patterns with thick bevels and no bend. The slimmer profiles of these tools will fit neatly into places traditional gouges and chisels won't reach. While the system is a fine idea, it will require a different approach than most carvers take. Hand pressure drives the tools, not mallet strokes. Blades and shanks come in a variety of useful patterns and curves -- including a back bent gouge and V parting tool -- that fit many difficult carving situations. The set is an economical alternative to the standard patterns. Tools provided include single and double beveled chisels, several selections of gouge sweeps for accurately matching patterns, and two thumbnail gouges. Flexcut also includes an instructional DVD, "Relief Carving in A Different Light," which outlines the basic methods needed for using the tools properly. Model makers working in softer woods will also find the set extremely useful, replacing many of the Exacto-style blades commonly used with traditional styles of light cutting tools which work much more efficiently. If your preference is for truly hard woods, the Flexcut system may not meet your needs. Dense woods still work best with stronger tools and a good mallet.